Just like a pizza menu - choose one of our recommendations below, or make up your own. Options include: getting yourself there; adding or removing nights; changing the mix of places to stay; saving some cash by self-catering and/or using your own tent on Domwe Island; adding in some SCUBA diving; adding on other destinations in Malawi. Any package pricing will still apply! Contact our Cape Town booking office for expert and one-stop service to get you there hassle-free! A previous guest had this to say...."Over the years we have been to Bon Bon Island off Gabon, the Seychelles, Bazaruto in Mozambique, Mauritius, Maldives, and many others. Not one of them comes close to Mumbo Island - it's insane beauty wherever you look. And what the photos don't tell you is how cool the people treat you - not too in your face or fussy, just there to look after you whenever you need it." 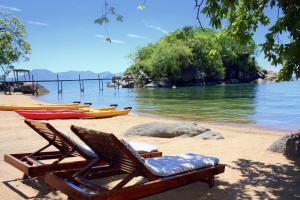 The Lake Malawi Island Hopping Adventure is a world-class sea kayaking trail that covers 25km in three days of paddling. 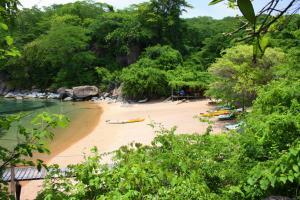 Adventurers spend two nights in each of the Kayak Africa camps on Domwe Island and Mumbo Island. 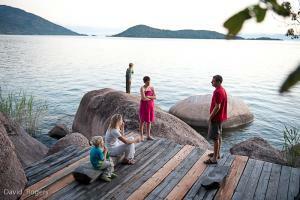 The trail is fully-supported and fully-catered, leaving guests free to focus on exploring and relaxing at will. Unleash your Inner Islander! Pack the bare minimum in a kayak and paddle off to a deserted tropical island. Self-catered and self-guided, a visit to Domwe Island is ideal for active and nature-loving guests looking to rediscover the simple life of times gone by.